On October 24, 2014, the World Health Organization (WHO) announced plans to produce millions of doses of experimental Ebola vaccines by the end of 2015, with hundreds of thousands ready halfway through the year. Marie-Paule Kieny, WHO assistant director-general for health systems and innovation, said that although vaccines are not magic bullets, they may be a good part of the effort to turn the tide of the Ebola epidemic. Kieny also said that, while phase I trials of two Ebola vaccine candidates (a chimpanzee adenovirus vaccine and a recombinant vesicular stomatitis virus vaccine) were already being carried out, as many as five other Ebola vaccines could begin testing by 2015. On November 26, results from the phase I trial of the chimpanzee adenovirus vaccine (Chimpanzee Adenovirus Vector Ebola Vaccine – Preliminary Report) were published in the New England Journal of Medicine. The vaccine was well-tolerated and induced the expected antibody responses in all 20 healthy adults who received it. The study was conducted at the National Institutes of Health (NIH) Clinical Center in Bethesda, Maryland. The candidate vaccine, which is dubbed cAd3-EBO and was co-developed by the NIH’s National Institute of Allergy and Infectious Diseases (NIAID) and GlaxoSmithKline (GSK), contains segments of the Ebola virus genetic material from the Zaire and Sudan virus species. The Ebola virus genetic material is delivered by a carrier virus (chimpanzee-derived adenovirus 3 or cAd 3), a virus that causes a common cold in chimpanzees but no illness in humans. The phase I trial was designed to assess the safety of cAd3-EBO as well as its ability to elicit levels of immune responses known to confer protection in non-human primates. The trial enrolled healthy adult volunteers (18 and 50 years of age). Ten volunteers received an intramuscular injection of vaccine at a lower dose and 10 received the same vaccine at a higher dose. No serious safety concerns were identified, although two volunteers that had received the higher vaccine dose developed transient fever within 1 day after vaccination. Two and four weeks following vaccination, the researchers tested blood samples from the 20 volunteers and found that all volunteers produced anti-Ebola antibodies within four weeks following vaccine administration. Antibody levels were higher in the volunteers who received the higher dose vaccine. In addition, the researchers assessed immune responses mediated by a specific type of white blood cells, called CD8 T cells. 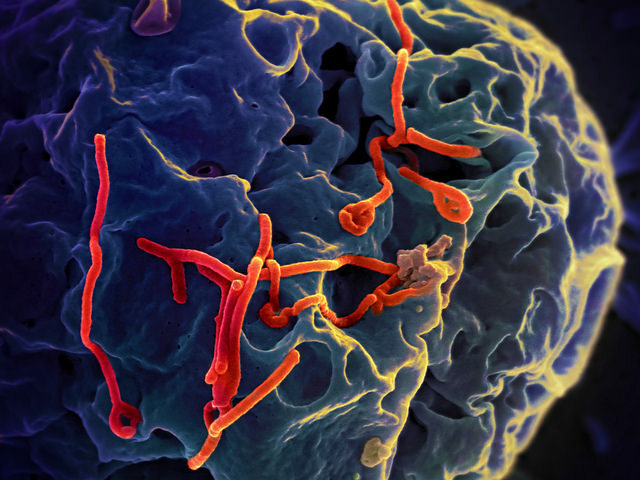 These cells are likely involved in providing protective responses against the Ebola virus. Four weeks after vaccination, CD8 T cells were detected in two volunteers who had received the lower dose vaccine and in seven of those who had received the higher dose. Another concern — among many others — relates to the finding that only some of the volunteers produced CD8 T cells active against the virus. However, all together, the results of the first cAd3-EBO trial represent an important first step towards the development of a safe and effective Ebola vaccine. Copyright © 2014 Immunity Tales. The National Institutes of Health (NIH) Clinical Center did a tremendous job by developing a vaccine that could not only save Africa but also save other continents from the virus Ebola. However, as this blog mentions, there are some questions that need to be answered in order to proceed to the next phase of testing. The preliminary report Chimpanzee Adenovirus Vector Ebola Vaccine shows that effectively all the volunteers that received the immunization produced Ebola antibodies but now people are asking if these antibodies are going to protect them from this virus forever. Right now, it is a hard question to answer because everything still in process; however, if we take a look to other diseases cause by a virus now treated with vaccines we will find Influenza. Basically, antibodies production will depend on the immune system of the person and the virus itself; therefore we cannot generalize how long does the immunity for these vaccines could last. Potent CD8+ T-Cell Immunogenicity in Humans of a Novel Heterosubtypic Influenza A Vaccine On the other hand, there is another unanswered question of why only some volunteers only produced CD8 T cells? Is this only due because of the amount of the dose or because of the individual’s genetically, developmental differences? I believe that there are so many factors that could vary the results from this vaccine. I agree with you, it’s hard to put an exact time stamp on how long a vaccine can last because everyone’s body reacts to it in a different way. One of the factors that affect the efficacy of a vaccine is how it is administered. In the article that you linked Potent CD81 T-Cell Immunogenicity in Humans of a Novel Heterosubtypic Influenza A Vaccine, it mentioned the vaccine for influenza was administered intradermal and intramuscular. When administered at the same dose, the side effects of an intramuscular vaccine were lower. However, when the vaccine was administered intramuscularly at a higher dose there seemed to be an increase in the severity of side effects. The vaccine currently can also be administered intranasal . The intranasal vaccine like the Modified Vaccinia virus Ankara (MVA) used in the study contained live attenuated influenza virus. Of course there’s more risk associated with administering a vaccine containing live attenuated virus but it induces a stronger T-cell response in children but still stayed in the within the safety spectrum. Just like where the influenza vaccine was at one point, researchers need to find what is the optimum route of administration for the Ebola vaccine as well as the optimum dose needed to induce sufficient T-cell response. Not sure why you mention the intranasal route of immunization for a vaccine. That’s done for influenza, because the vaccine is transmitted through the air (respiratory tract). Influenza is a respiratory infection, so the use of the intranasal route makes sense. But what about the Ebola virus? Does Ebola get in people and infects them through the mucosal membranes? If yes, then it is OK to talk about the intranasal route for an Ebola vaccine. I think it should be taken into consideration when comparing the Ebola virus to the Influenza virus, the amount of time in which each of these viruses have been acting on the human species. Influenza has been infecting people for millennia with accounts describing symptoms dating as far back as 2,400 years ago. However, the earliest known outbreak of Ebola occurred in 1976 as recorded by the CDC. I think it should also be taken into consideration the geographical distribution of the two viruses; Ebola being primarily restrained to Africa whereas Influenza has global distribution. Considering the timelines and distribution of each may help explain the differences in immune responses elicited between the two vaccines including the varying production of CD8+ T-cells seen in the test subjects. I agree with you about how it needs to be taken into consideration that the Influenza virus and Ebola virus have different time periods of introduction to the human population. There is no denying that our current immune system has had a longer chance to adapt to the constant mutations of the Influenza virus and built up a stronger response to the virus along the generations. However in addition it needs to be understood that current technological advances have made it easier for the human population to travel, compared to 2,400 years ago and even compared to 1976. The transportation industry has explodes in the past couple of decades and made it easier for humans to travel from one point to another. This ultimately caused the unfortunate result of giving viruses the ability to spread around the world the same fast pace. While the transmission of Ebola is not airborne, it does not hinder the spread of the virus to travel over oceans as we saw happening in the United States this year. If not kept into check with current vaccine research, I believe Ebola will achieve the global distribution of the Influenza virus. This is why this research is so important, the possibility of more and more outbreaks have been made more common due to our current transportation methods. I see your concern that the lack of current distribution of the virus could explain the difference in the immune response to the vaccines and trials. This would make sense especially for human populations which would not normally be in the geographical area of the current outbreak, since they would not require a specialized defense of their immune system to the virus. Too also expand on your thought, it is also important to remember the population size difference between 1976 and the current year. According to multiple statistical websites, the human population has since 1976 grown around three billion strong. That is three billion new immune systems, while very similar, still act differently to different immune introduction. So while it is great that the twenty volunteers have shown improvement, it does not mean that everyone else would have the same effect and respond in the same CD8 T Cell production. According to the Chimpanzee Adenovirus Vector Ebola Vaccine — Preliminary Report — NEJM.htm the The recombinant chimpanzee adenovirus type 3–vectored Ebola vaccine has components from the Zaire and Sudan species that are responsible for majority of the EVD outbreaks. The WHO Ebola virus disease.htm states there are 5 known ebola strains identified as: Zaire ebolavirus, Bundibugyo ebolavirus, Sudan ebolavirus, Reston ebolavirus and Taï Forest ebolavirus. We should keep in mind that viruses have tendencies to replicate rapidly, which is relative to viruses like the Flu virus that are updated yearly. In another study, the Ebola Virus Pathogenesis Implications for Vaccines and Therapies.htm, states that “Ebola virus does not exhibit a high degree of variability that other enveloped viruses may employ to evade the host immunity, but Ebola virus Glycoproteins alters target cell functions which acts as a novel strategy for immune evasion that could have arisen through an evolution of EVD.” To our knowledge, this vaccine will be ready for use in 2015. As we know, Viruses replicate and evolve rapidly so I am concerned if this vaccine will be effective by the time it is ready for use in humans by 2015 against the 2014 strain? And Will this vaccine be able to elicit an immune response against less common strains: Bundibugyo ebolavirus, Reston ebolavirus, or Tai Forest ebolavirus,? While NIAID and GSK scientists are trying to learn why this candidate Ebola vaccine does not provide lifelong immunity unlike most major vaccines, it would be best if cAd3-EBO is produced and distributed on a large scale as soon as possible before Ebola continues to spread throughout Africa, after such positive results were obtained from its test trials. The Ebola death toll is approaching 7,000, and more than 16,000 people have been infected in West Africa alone. (http://www.dailymail.co.uk/news/article-2855036/Ebola-death-toll-hits-7-000-World-Health-Organisation-misses-ambitious-targets-contain-deadly-disease.html) As soon as this potential vaccine is distributed to the masses, the rates of infection should fall at astounding rates. If the only downfall to cAd3-EBO is the “clear reduction (of antibodies in under) 10 months,” scientists should not wait until a stronger vaccine is developed that provides longer durations of vaccine protection. Similarly to our common flu shot that only provides 6 month of protection ( http://www.travelhealthline.com/vaccines.html#inf ) , cAd3-EBO should be given in high doses as a short term solution in this Ebola epidemic. I see a few problems here: 1) The study was done in people (volunteers) who have a very low risk of becoming infected by the Ebola virus (American individuals resident around the research center where the trial was conducted, i.e., Bethesda, Maryland); 2) The number of volunteers is low; 3) The vaccine tested in this study is not the “monovalent” vaccine that will be used in Africa. The results of this study are a scientific advance, but only modest. The study does not tell us anything about the potential for controlling the Ebola epidemic in West Africa. Sam Grey, I agree with your point that the amount of individuals used in this study was too low and it needs to be taken into consideration that not every geographical population might react the exact same way to the vaccine. Though I can understand the amount of pressure these organizations are being put under to come up with something fast and efficiently due the possibility of Ebola becoming a pandemic if not kept in check. However on the point that the study was done on volunteers that currently have a low risk of being infected, I disagree on. I actually believe it was a very smart move to use volunteers who have no geographically connection to the current areas that are suffering from the Ebola epidemic. The reason being is that these groups of populations are the most susceptible to the virus, even more than the populations of the areas that have been suffering with this disease since 1976 (as pointed out by CG). Granted those populations have been dealing with the Ebola virus for only roughly 38 years, but that is still hopefully enough to build up a generation that might have a stronger immunity to the virus due to their parents having possibly survived the disease. This general occurs with most diseases over time. A good example of this would be the combination of the Black Plague (mid 1300s) and the later smallpox epidemics which caused great amount of deaths in Europe according to the article “The Bright Side of the Black Death” by Pat Shipman in the magazine American Scientist (Nov-Dev 2014). According to the article, the survivors of both diseases ended up giving their next generations a higher immunity to disease with the emergence of the genetic allele called CCR5-∆32, which aids in the resistance to HIV/AIDS. Unfortunately a great amount of people died due to these diseases, especially because most of the population in Europe has no immunity to it. This seems very familiar when looking at the Ebola virus. That is why I believe they are using the most susceptible population to test the vaccine on. Since if it works on the most naive immune system to that virus, it should work in a population that has had experience with it and might have a stronger immunity to it. Either way I hope that a vaccine or treatment will be found soon because too many people have died from this disease already. I think it is great that researchers have been able to create a vaccination for the Ebola virus. Luckily, Ebola is mostly confined to the West African region but, unlikely as it may be, I wonder how individuals will react if Ebola actually does spread to other continents. My concern is the current vaccination war that is gaining popularity in today’s culture. Even if this scenario happens and vaccinations are offered, I wonder how many people would actually become vaccinated. The media is swarming with medical issues vaccinations pose and it has people talking, some of which without intellect. I also wonder about ethical issues that could arise if the severity of this disease was to force everyone to become vaccinated to prevent larger outbreaks in the future. There’s also the issue of how soon this vaccine should be available to the general public after the testing phase. The GEN took a recent poll and of the individuals that participated, 42.8% believe it should be available in one to two years. Accelerated vaccination for Ebola Haemmorhagic fever in non human primateswhich was published in 2003, vaccine development has been going on for years it is just now because of the movement to a new continent that we are hearing about these vaccines. Although it may take a while for this vaccine to be officially available to the “general public” who exactly are you referring to when you say general public? West Africans? Americans? As great as these vaccines are my hopes are that an affordable option also becomes available for those who Ebola greatly affects. I am glad you posed this question as it has given me another perspective to contemplate concerning this case. The current research goal is to interrupt transmission through vaccination and the results of this vaccine trial appear to be promising in a time of uncertainty and fear of pandemic spread of human outbreaks of severe EBOV-associated hemorrhagic fever. First and foremost, I applaud those humans in the trial that allowed vaccine testing to be performed on them and I am thankful that it did not produce any lethal response in any of the volunteer subjects. Research data showed supportive evidence that the vaccine did indeed induce strong responses in both humoral and cell-mediated immunity, but the issue that arises from the conclusion of the data is the idea that the level of “success” for both immunogenicity and reactogenecity are dose-dependent; subjects that received higher doses showed a higher overall percentage of cell-mediated immune responses than those receiving lower doses (70% CD8+ response vs. 20% CD8 T-cell response, respectively ). I believe that with most (if not all) vaccination trials, there is always moments of uncertainty – but it is these moments that lead researchers to greater discoveries. What comes to mind for me is the Polio vaccine. Initial testing on a small group of human subjects, with results showing less than 99% efficacy, led to vaccination testing campaigns and further research which ultimately led to the eradication of polio worldwide. Just the introduction of the vaccine, initially by Jonas Salk , initially led to an initial decline in the incidence of polio cases. It is clear that years of research ultimately led us to more effective types and methods of polio vaccination, but it is also clear that the initial use of this vaccine showed promise and decline in morbidity and mortality. Perhaps this is where we begin our journey on the path of eradication of the Ebola virus. I understand that yes, finding the exact dose that creates a robust virus-specific CD8 T-cell response will be necessary and it might even be necessary to create a booster dose (an extra administration of a vaccine after an earlier dose), ,but perhaps we can begin vaccinating small populations of people with the same dosage amount used in the study that produced a more robust immune response to see if we can begin to reduce the transmission and spread of this horrible virus. We need to start somewhere and we shouldn’t wait too long. Effective vaccine development (http://www.historyofvaccines.org/content/articles/vaccine-development-testing-and-regulation) is a complex and lengthy process taking roughly 10-15 years to complete. Unlike developing traditional drugs, vaccines have to be tested with a greater number of human subjects. There are a few things that should be considered when developing the Ebola vaccine, primarily being the transmission mechanism of the virus. According to the CDC (http://www.cdc.gov/vhf/ebola/transmission/index.html) the Ebola virus is spread in humans through direct contact via broken skin and mucous membranes with blood or bodily fluids; contaminated needles and syringes; and infected fruit bats and primates. The main reason that the transmission mechanism should be focused on is because, the vaccine should follow the same pathway that the virus follows. For reasons such as this, I do not think that the Ebola vaccine development should model an influenza vaccine development because their pathogenesis is different from each other. A study completed at UPenn showed that in order for an Ebola vaccine to be effective CD8 T Cells should be activated and involved for the elimination of the virus. In the same study, it was shown that the CD8 T cells have to recognize and respond to a H-2d restricted epitope (NP279 – 288) and two H-2b restricted epitopes (NP44 – 52 and NP288 – 296) (http://www.sciencedirect.com/science/article/pii/S0042682203007037). Though I am not sure about the current state of being able to target specific amino acid sequences while developing a vaccine, I believe that it should definitely be considered. Since everything is happening in real-time, to an extent, we are somewhat asking for the impossible to occur (we are trying to take a 15 year process and trying to complete it in 15 months, if not even lesser amount of time). You bring up a good point that I think has been lost in the media induced hysteria concerning Ebola; the fact that the world is asking, expecting even, that a vaccine can be produced and distributed as if it were a perishable good ready for purchase at your local retail store. In our modern culture of “I want it all and I want it now” it is entirely likely that in the rush to halt the spread of the Ebola virus, inferior and possibly dangerous vaccines will be created. What good will come of that? While the research into creating an effective vaccine for Ebola is fascinating, I think resources should be allocated to the prevention of transmission and dispersion rather than immediate vaccination. Using the Influenza virus as a historical reference, vaccinating against Ebola could prove to be a never ending game of “catch me if you can” and we all know where that ends, a line at your local pharmacy awaiting this year’s vaccine. So do you think that it is a campaign that is geared more towards making money through the pharmaceutical route — meaning that money should be made off vaccination campaigns rather than being spent on prevention campaigns? Because I think that it is an interesting point that you are making (“ a rush to halt the spread…”) and it reminds me of the swine flu pandemic of 2009. The first detection was in California in a 10-year-old-patient on April 15, 2009 and only 6 days later (April 21, 2009) the CDC began working on developing a virus that could be used in a vaccine to protect against this new influenza strain. Only 7 months later, in October of 2009, the CDC launched the national influenza 2009 H1N1 vaccination campaign. The campaign worked and people began to get vaccinated, but very early on recalls from vaccine manufacturers began to occur. On December 15, 2009, the manufacturer Sanofi Pasteur issued a voluntarily recall stating that some of their batches had a potency level below the “specified” range. These are vaccines that were given to infants and children! Can you imagine the mass hysteria produced in response to this recall? As you said, “in a rush to halt the spread of the Ebola virus, inferior and possibly dangerous vaccines will be created” – is this history repeating itself? I am absolutely 100% convinced this is a campaign for pharmaceutical profit. Call me cynical, but vaccines are big business and even bigger business for the FIRST company to introduce the newest vaccine into the market. I have seen no evidence that would convince me, as an American citizen, that I should be vaccinated against Ebola. However, if we are to believe the marketing department (the media) of the big pharmaceutical companies, an epidemic is just seconds away. These companies have to create a demand for their product or else the money invested in research and development would be a huge waste. It may be crass to say this, but if you are aiming to maximize profit from a product where would you want to sell it, African nations or the United States? My bet would be the United States. The question is, how do you get people to pay for a product they don’t need? The answer is, inundate with them with propaganda and inflammatory language to convince them otherwise. I will step down from my soapbox now and end my rant there. However, once the media driven fervor subsides I believe a sufficient vaccine will be developed. It may not be during this current “outbreak,” but it will happen eventually. The difference being that when it does happen, it will more than likely be announced through a six second segment on a local news outlet. I agree. At this moment I don’t think that there should be a required vaccination against Ebola. My main reason behind this is that the primary way that Ebola is transmitted is via bodily fluids. Ebola is not like malaria or dengue where there is a vector organism (mosquito) that is transmitting the disease. However, I do also want to note that Ebola is a virus, and viruses have the potential to mutate. At this moment, if we (especially the healthcare workers) are just careful about how we interact with our surroundings after being in contact with an Ebola patient, I believe the risk of spreading Ebola goes down significantly. If there is a mutation in Ebola to a point where it becomes airborne or even possible to be carried by a vector, I would definitely advocate for widespread vaccinations for the general public. I would say one of the reason why making an Ebola vaccine is challenging is the number of precautions and the limited facilities that are able to perform research on the virus. Because the virus is classified as Biosafety level IV, only a limited institutions are able to contain the virus. Also, the number of researches who are trained to conduct research following the safety protocol working under one of the challenging environments. One of the ways to speed up research is to work with specific proteins found in Ebola that are consistent throughout the strains. once the protein is isolated, that specific genetic code would be loaded to a plasmid and introduced into bacteria where the proteins could be grown rapidly and harvested without the need of cultivating the virus. A phD students dissertation focused onMarburg antigen paired with flagellin construct. The result showed that the process used in that experiment has fewer steps and the protein in question stimulated TLR5 response to the antigen. Although vaccine development takes a considerable amount of time for it to be released to the public, most of the time are taken up by clinical trials. However, find other ways to speed up vaccine development and could put down a blueprint for further vaccine development. I am wondering how Ebola virus could escape the immune system of human being. After doing some general research, I learned that one of the viral proteins, VP24, binds to STAT1 to prevent it from entering the nucleus. The JAK-STAT pathway is one of the very important and common pathways in immune response that is triggered upon cytokines binding to their receptors. In this case, STAT1 is the downstream of interferon gamma and IFNs are usually secreted by host cells to indicate infection. STAT1 is a regulator of gene expression that is specific for antiviral response. Therefore, as long as the vector of the vaccine does not contain the protein that facilitate the escape of Ebola from immune response, the other viral proteins could possibly trigger CD8+ T cell mediated immune response to against the infection. As to the problem of not lasting long, I doubt if there is another viral protein from Ebola interfere with the differentiation of memory T cell or B cell. Also, I doubt it would be safe even the volunteers produce expected antibodies against Ebola. According, to this article “there are several questions that will need to be answered…to determine whether or not the cAd3-EBO vaccine has the potential to be truly effective.” A question I would like to pose is whether or not this vaccine would be able to treat children and infants? I ask, because children and infants are known to have lower immunological tolerance and memory, compared to their parents. If indeed cAd3-EBO is able to incite an immune response, who’s to say that it would work on an eight year West African child, who was recently diagnosed for being infected with the Ebola strain. Even though, I agree that this vaccine may potentially to treat patients, while preventing future outbreaks, I’m still dubious about its effects on children. My reluctance resides in the fact that there aren’t any volunteers (i.e. children) that would willfully sign up to be administered the vaccine, especially infants. I believe researchers need these statistics during their trails, in order to grasp a better understanding of the vaccine. By them conducting these trails they would be able to better assess whether or not the vaccine has the capability of treating children, and if not they are able to catch it early in order to create a vaccine that treats and cures all ages. Currently, researchers are conducting monovalent trials, which may render a vaccine that is better adapted at treating all ages. So, hopefully we can see a vaccine in the near future.